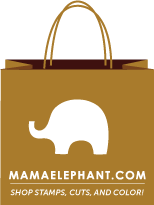 I had such a great weekend and my blog counter is now over 70,000 so I thought I would give away some freebies! 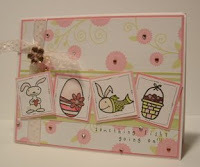 Just leave me a comment on this post and on Friday May 4, I will randomly draw a winner! 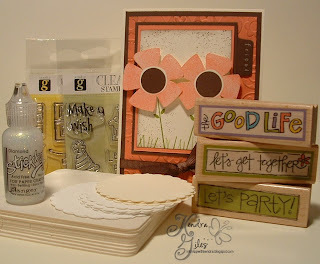 What's better than two packages of Studio G clear stamps and 3 $1 stamps from Michaels, 10 chipboard coasters, diamond stickles, a dozen mega scalloped punch circles, and a card made by me??!!! Get to posting! These wondermous BRAK's are long overdue to be posted on my blog so here they are! 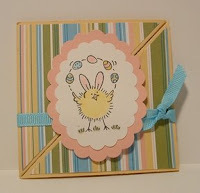 This cutie patootie card was sent to me by Debbie Seyer! 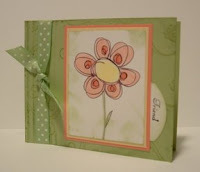 Debbie, I totally love this card - the layout is too cute and the colors are great - thanks so much for a beautiful BRAK! 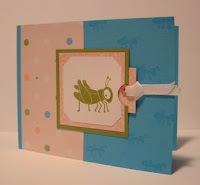 Aww look at this way cute bugs and kisses card from Simone (spazzgirl) - love everything about this card - thanks so much Simone! 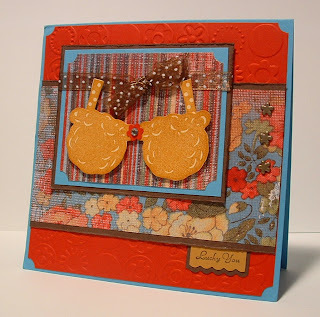 This completely adorable tri-fold card was sent to me by none other than Teresa Shaw - isn't it just supah?!! love it, love it Teresa - it's the first one I have received and I just love it! thanks! 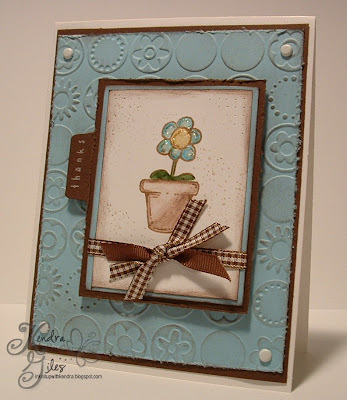 OMG look at this beautimous post-it-note holder that was sent to me by Angie Juda - doesn't it rock?!! 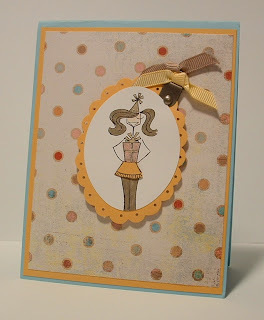 I am totally casing this Angie - I LOVE IT! Thanks soooo much for sending it my way! I WAS TAGGED! Laura Leonard, Kelly Sampson, Joanne Basile and Kirsten Dubosque all tagged me! Thank you girls! 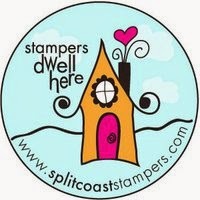 :) I now have to list my 5 favorite blogs I love to visit - that's supah hard for me because I have dozens!! So I narrowed it down to my five bestest blogging buddies. Alright girlies - now it's your turn! I finally had a few spare moments to create somethin' cute for Hambo Stamps, I have been falling behind in my design team duties!! I have been supah, supah busy and haven't known whether I am coming or going. *ugggh* I absolutely loved this slice of cake when I saw it and knew I had to have it - and that sentiment just goes perfectly with it! 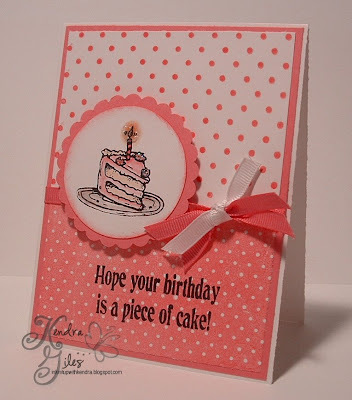 I don't want to be an enabler..........what am I talking about sure I do........go to hambostamps.com and get your cake slice stamp and this adorable sentiment to go with it! 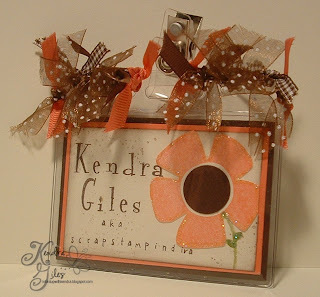 Tell Monica that Kendra sent you! 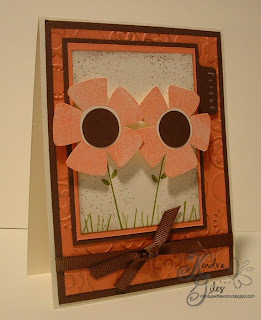 The background paper was created with background stamps from Cornish Heritage Farms - the reverse polkadot background and the polkadot background (looks just like DP doesn't it? ).......Debbie Olson enabled me to buy them!!! Thanks Debbie :) I got my new papertrey stamps in the mail a couple of days ago and I am hoping to get the chance to play with them soon! 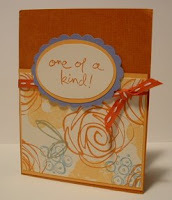 I have been getting so many wonderful Blogger RAK's in the mail it has been super hard to keep up with them! I am so loving getting happy mail - you girls rock! How did I get so lucky to get so many bella cards?! 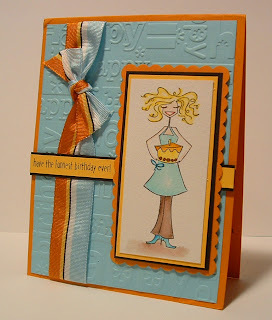 I got this birthday bella card from my friend Joanne Basil. Thanks so much Joanne - I appreciate you wishing me a happy birthday! 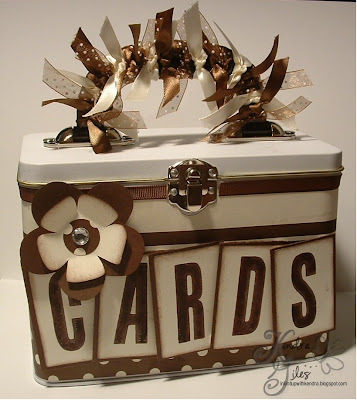 These are the two card tins that I had to finish tonight - they have to be delivered tomorrow. I am super happy with the way these turned out. 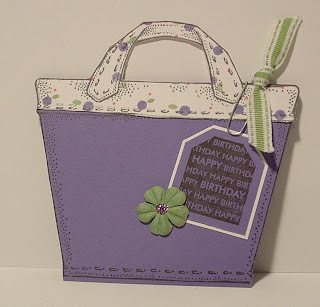 They are filled with 15 different cards for birthday, friendship and thank you. My co-worker ordered these for birthday gifts, I hope she loves them as much as I do. It feels really great to get something accomplished, but then I realize I still have a ton of work ahead of me. 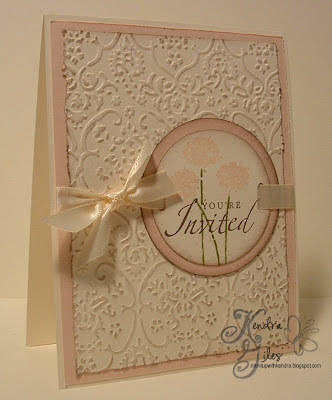 :) Robyn and I will be getting started on Wedding Invitations for our girlfriend - about 200 to be exact! We have several weeks to get them completed. 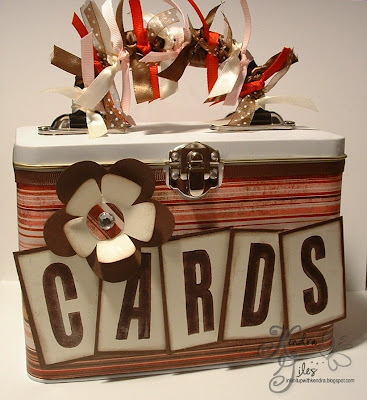 She and I are also attending the Arlington Shoebox Swap that Emily and Jackie are hosting the end of this month - we still have to come up with a card for that card swap - oh my - and neither of us have a clue as to what we are going to design! 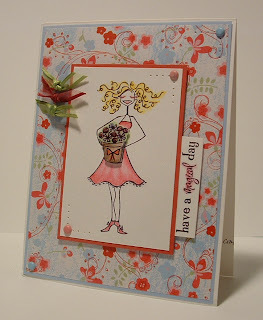 This is another dahling stamp from Hambo Stamps! It is actually just a single cupcake - I masked and stacked the cupcakes. I think they are so cute that way! 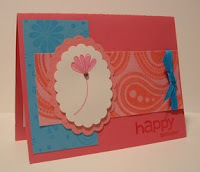 Love, love, love the cuttlebug background embossing folders - they rock! 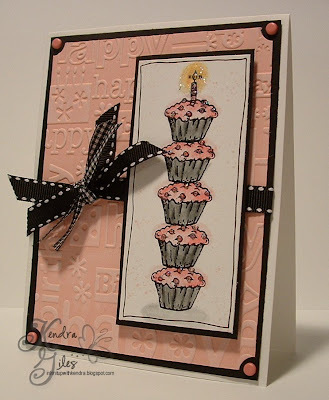 I watercolored the cupcakes with my Prismacolor Pencils and Gamsol - then added stickles to the sprinkles. 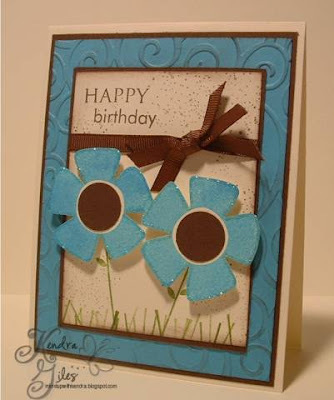 This card is perfect to add to my birthday card stash - I have been running low.